For too long, transportation planning has focused on cars rather than people while neglecting communities of color and low-income neighborhoods. 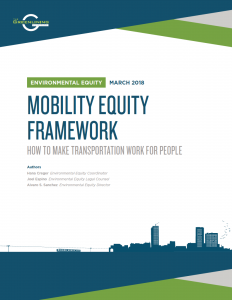 This framework offers planners and community advocates a step-by-step guide to a more community-centered transportation planning process that focuses on the mobility needs of communities and puts affected communities at the center of decision-making. It includes specific metrics to help evaluate mobility from an equity and community-centered perspective to help transportation planning focus on the needs of people, rather than car-centric infrastructure, as well as ideas for how to develop a people-based transportation planning process.